ALFA's heavy duty precast Concrete Palisade fencing is a high quality security system suitable for any walling application. A few use it on their residential stands but the more common and typical applications include fencing-off national roads, suburbs, schools, sensitive sites and industrial premises. Being a Pretoria based manufacturer of precast heavy duty concrete palisade fencing most of our fence erection work takes place in Gauteng. We are also direct suppliers and installers to the surrounding areas of Mpumalanga, Limpopo and North West. ALFA’s heavy duty concrete palisades are made to last for many, many years and to provide maintenance free security. One of the numerous benefits of this product is its open slat configuration. The product does not completely obscure the fenced-in area and at the same time also allow visibility to the outside of the premises. Three sides of all concrete elements have a shutter or off mould finish and are therefore smooth. The fourth side has a wood float finish. Designed and manufactured to exact engineer's specifications, all ALFA’s palisade concrete elements are steel reinforced and cast with a concrete mix that reaches 30MPa in strength after 28 days. This ensures a strong and robust security barrier at all times. 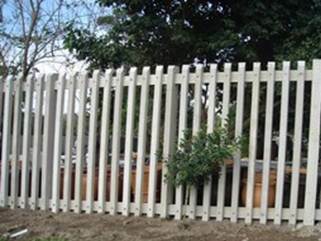 We manufacture a 9 slat or pale heavy duty 1.8m and 2.4m high concrete palisade fence – 6ft and 8ft imperial. Each section is 2 meter wide, measured from post centre to next post centre. A section is made up of two posts, the 9 pales and two cross beams or rails to which the pales are bolted. Carriage bolts are used to secure the nine pales to top and bottom rails. The bolts are counter sunk, thus allowing the holes to be grouted over to conceal the bolts from tampering. Each main post is planted in a foundation of 450 x 450 x 600 millimetre deep and consisting of a mixture of cement and crushed stone that should reach 15MPa strength at 28 days. Send us an email if you would like to receive our product specification sheet. The installation of our concrete palisade fencing can be fairly rapid. A single installation team can typically do in excess of a 100m per week. The actual meters completed per week will however depend on the number of teams allocated to the project, the availability of stock, the weather, prevailing soil conditions, and a few other factors such as the client’s cash flow. ALFA always try to meet the client’s needs. Concrete palisade fencing provides a low cost but high level of security option when compared to other wall or fence alternatives. The actual cost of a concrete palisade fence depends on the length of wall erected, its height, the number of gates installed, and number of corners, the terrain and also transport cost. Transport is a significant component of the price of concrete palisades. The reason is the sheer weight of material. Our heavy duty 2.4m precast concrete palisade weighs in at about 30 ton per 100 meter installed. We invite customers to contact us for a free quotation as publishing prices and a price list on the website without knowing location and basic works requirements will be counterproductive. Simply email us the length of concrete palisade fencing you require and installation site location or address and we will email an estimate of per meter cost to you in return. We talk to everybody. You are welcome to talk to us, even if you talk about cement instead of concrete, call us Alpha instead of ALFA, talk about prefab and not precast or spell palisade as pallisade, we don't mind a bit.